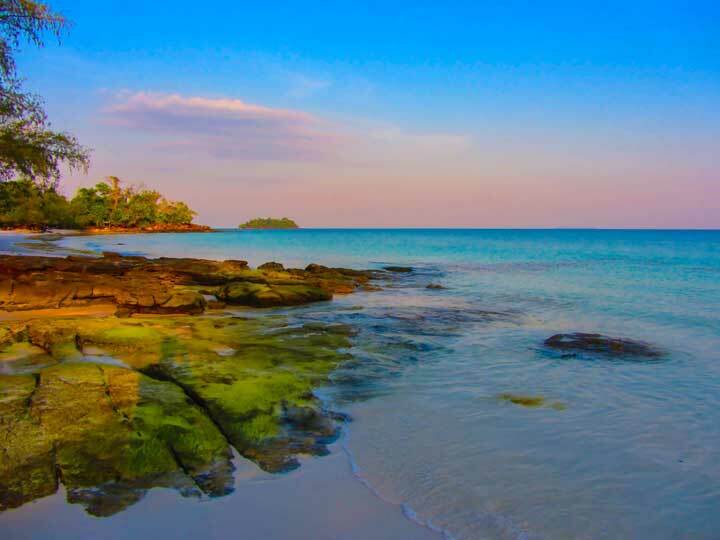 The Mesmerizing Koh Rong Islands of Cambodia beckon You! Koh Rong is one of the most mesmerizing offerings you’ll find in nature that will completely blow you away. Koh Rong is the second largest island of Cambodia approximately 25 km off the coast of Thailand that is beckoning you for a visit at least once in your life. With a 43 km coastline, this island attracts tourists year after year and for good reason. The island runs famous resorts and bungalows which are foreign owned serving as the perfect escape from the day to day stacatto of mundane lives. What makes the Koh Rong islands so desirable is the fact that they’re cut off from human civilization offering pure bliss and untouched beauty. The island offers mesmerizing half desert terrains without the influence of civilization helping you ditch the noisy humdrums of traffic and horns helping you achieve a sense of peace. Waking up and being welcomed by the pristine sight of extended white beaches is like being ushered into heavenly goodness. You can stay in one of the 20 beautifully handcrafted bungalows situated atop white sandy beaches which can comfortably accommodate 4 people. The escape will surely feel blisful as you’re welcomed by the sound of crashing waves instead of yanking horns and city noises. You can book easy tickets to Cambodia with us to enjoy a relaxing stay at the Koh Rong Islands that are nothing short of ethereal magic. Koh Rong is your personalised island that helps you connect with nature once again with its spotless and unused surroundings. You have a varied menu at a variety of beach bars strewn across the beach giving you an uninterrupted view of marvelous oceans under the enchanting night sky. Sip through exciting drinks and mouth watering food as you feel the fresh salty waves hit you and rejuvinate you thoroughly. With a pair of swimming trunks and gear along with some sun tan lotion, and you’re good to go on this relaxed vacation that will surely leave you refreshed. Koh Rong is the perfect location for adventure junkies as well who’re looking for great sports and activities to get their blood pumping. One particularly interesting attraction is the High Pont Rope Park which has a sturdy zip line built covering a span of over 23 trees. You get to explore and fly zip lines over trees at almost 24 meters above the ground for the perfect adrenaline rush. Apart from this, the island also offers options to scuba dive allowing you to rendevouz with a variety of aquatic life form and under water coral reefs that will surely blow you away. Book bungalows and find all the details about this beautiful island to rediscover life and nature once again. Apart from scuba diving, you can also opt for snorkelling where you can explore further archepilegos in the surrounding waters that will surely bring alive the explorer in you. Go in for an early morning trekking spree to discover the various nook and crannies of the island and gel with the local village folk. If you’re looking for an experience you won’t forget, then opt for fishing with local veterans who’ll help you find a great catch. The Koh Rong Islands are the perfect escape into nothingness and a great diversion from pollution and human population to bring you a holiday you’ll remember for life. Be it island exploration, fishing, getting long massages and indulging in spas, the Island is well equipped to calm your senses and help you recapture your lost soul with its innocent beauty. Be sure to make a trip to these exotic islands which are yet to be tarnished by human influence and make the best of your relaxing vacation.